In continuation with the different phase of observance of “Vigilance awareness week” from 30th Oct.2017 to 4th Nov,2017,a team of senior Professors from Central University of Jammu, Prof. Lokesh Kumar Verma, Academic Coordinator, Prof S. K. Sharma, Prof. Vivekananda Chair Prof. N. K. Tripathi, Head Life Sciences, Prof. D. L. Choudhary, Head of Deptt. Of Yoga, Prof. Deepak Pathania, Dean Students welfare and Dr. Aman Bhardwaj, Asstt. Prof. Dept. of Educational Studies visited Dogra Educational Trust which runs a group of colleges namely Dogra Degree College, Dogra law College and Dogra Degree College of Education. 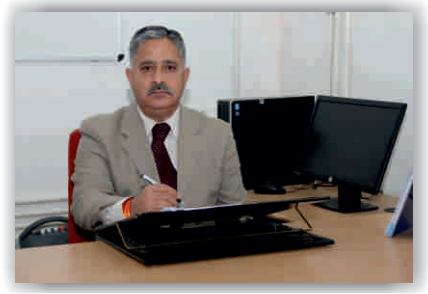 The programme was inaugurated with the welcome address by the Principal, Prof. V. P. Magotra, Dogra Law College. Introductory session was initiated with the address by Prof. S. K. Sharma who in his speech elaborated the various provisions enacted in law to eradicate corruption. Other eminent professors Prof. Lokesh K. Verma, Prof. N. K. Trpathi, Prof. D. L. Choudhary and Prof. Deepak Pathania also spoke on the various issues related to corruption which seems to be a major obstacle in the path of the development of the country. Interactive session was also held with the students from various Dogra group of colleges. On this occasion many the members were also present.Th.Gulchain Singh Charak Ji Former Minister and Chairman, Dogra Educational Trust, Kr.Samar Dev Singh Charak Ji Secretary, Dogra Educational Trust graced the occasion with their presence. Sh. S. C. Khajuria, Director, Adm. and Campus Development, Dr. Vikesh Sharma, Principal Dogra College of Education and Ms. Bela Charak, Principal, Dogra Degree College along with other faculty members were also present in the programme. Member trustee Kr. Gambhir Dev Singh Charak also addressed the gathering highlighting the root causes of corruption. Ms. Mangala and Ms Shefali from Dogra College of Education, Ritwik Sharma and Ravneet Kour from Dogra Degree College and Virinda Charak and Ananya Sharma from Dogra Law College expressed their opinion forcefully to curb corruption. The programme was conducted by Mrs. Parema Bakshi and concluded with the vote of thanks by Dr.Komila Aggarwal.